Cutting Edge® Bulk Rock Salt is an economical and effective ice melt solution that melts at up to 15 degrees Fahrenheit. Our deicing salt is a non-magnesium product and is specially formulated with a corrosion inhibitor to be less corrosive than basic rock salt, while melting ice and snow quickly. It also contains an anti-caking agent and is coated with an orange color indicator to ensure cost effective, even dispersion. 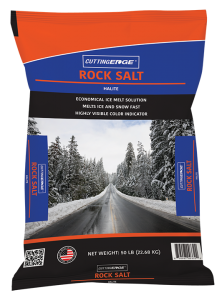 Its longer shelf life and easy dispersion through a spreader makes our Cutting Edge® Bulk Rock Salt a great choice for commercial or residential use; providing no-slip protection, a two-step heating process that provides a long-lasting defense against ice on driveways, sidewalks, steps, or anywhere it’s applied. Our unique wholesale road salt comes in UV and water-resistant, non-slip packaging, which provides extra protection for outdoor storage and can last year after year to provide ice melt protection for your home. Available in pallets of 50lb bulk road salt bags!